Day hiking today is popular with campers of all ages. Anyone capable of walking long distances can certainly do this. Day hikers’ objectives is to hike or walk for the day then return to their campsite that same day, usually as night approaches. Besides being able to walk long distances as a day hiker, you must also be ready for any weather conditions and have the right tools and techniques to find the right route back to your campsite. One very important thing in hiking is selecting the correct footwear. Because hiking is defined as walking, which simply means being always “on your feet”, you must purchase footwear designed specifically for hiking and that is comfortable after many hours of walking. 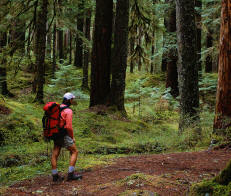 Backpacking is generally the most exciting and basic way to experiencing a wilderness adventure. 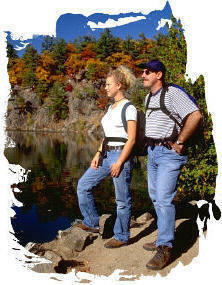 Backpacking adds new excitement and elements to any hiking experience because it extends your visit in the backwoods. You may travel far into the wilderness because you are not obliged to go back to your campsite at the day’s end. It is exploring beautiful and sometimes wild country, and being self-sufficient while hiking with camping essentials in a comfortable backpack. Put simply, backpacking entails having to carry a pack of essential camping supplies on your “back”. The longer your trip, the more supplies you carry. What you take along with you as well as how far you hike actually depends on you. Preparing for your backpacking trip involves assembling, selecting and packing supplies and gear that you need and want to bring along with you. Excessive gear or the wrong kind of backpacking gear can result in an extremely heavy load that will spoil your hike. Where Should we Go Camping? When's a Good Time to Go? Backpacking equipment generally costs more compared to car camping, however much less compared to RV camping and take note, backpacking campsites mostly are free. Backpackers who camp out on the trail overnight need some type of shelter. Special Backpacker's tents are the answer. An average sized adult will be comfortable with a 30 square feet area. This would mean that the ideal size for two persons is a ten by ten foot tent. Carrying a tent larger than that could pose a problem to the campers because it's a heavier load and finding a level spot would be quite a task. Non-rusting zippers, nylon-tape-reinforced seams are a must to find in a tent. Usually, a three-season tent suffices for campers use since not all campers deal with snow. After selecting a tent, next comes the sleeping bag. Of course, comfort and space is taken into consideration when deciding on which to buy. There are rectangular and the mummy shaped. Rectangular shaped ones are spacious and most comfortable. For those that camp at a lower temperature area, the mummy shaped sleeping bag is used for more insulation. It's important for zippers not to pinch or catch on the fabric. Buying an adult sized sleeping bag for children is recommended for those that camp out regularly. A night out won’t be too good without a hearty meal. The best stove to have is a standard-sized, two-burner stove. Manufacturers offer stoves that can accommodate pot sizes. Though there are stoves that are fueled by kerosene, unleaded gasoline, or butane, it is wise to choose from either “white gas” or propane. The white gas or commonly known as the Coleman fuel gives off intense heat, making cooking time shorter and food is free of gas odor. Propane-fueled stoves are widely used mainly because of user-friendly features and availability. Stove extras such as the stand, wind screen and stove starters are important accessories for your camp site. Wind screen will be greatly appreciated during windy and stormy days. Stove starters prevent burning the hands and stop the hassle of using matches.